Understand your SmartSecurity network. Learn about the three preconfigured networks that are set up and how to manage their IP Space and DHCP settings. SmartSecurity’s MX64 security appliance sits between your business’ devices and the Internet and is the heart of the network. It manages both your internal and Internet traffic, along with managing IPs and VLANs within your network. Network configuration Your SmartSecurity appliance comes with a base configuration comprised of three distinct networks (subnets) that all the devices within the network will use. While this base configuration will meet the majority of a business’s needs, the configuration can be modified to suit the specific requirements of your business. Management: VLAN 1 default address space is 192.168.100.x./24. This is where non-Internet devices such as Voice Traffic will reside. Private: VLAN 10 default address space is 192.168.1.x./24. This is where all of your business networks will reside. Connecting to the private wireless network (Private SSID) will automatically place your wireless devices into the private network where they will share the same access rights and network policies as the wired business devices (and will be able to print and share files as well). Guest: VLAN 50 default address space is 192.168.50.x/23. The guest network is where guests who visit your business can go to access the Internet while on your premises. This network is most often used over WiFi and seamlessly integrates with SmartWiFi. Joining the Guest SSID automatically places a guest in the guest network. Demilitarized zone (DMZ): VLAN 75 default address space is 192.168.75.x/24. This is where all Internet-facing servers in your network should be housed. Examples of such servers include a website you host from a web server in your business or your email server. The DMZ separates these Internet-facing servers from your private and guest networks so that those networks are protected from any potential attacks. Learn which SmartSecurity features are supported by Shaw and which support areas will require your own IT department to manage. Shaw-supported features: These features and/or functionalities are present and supported by Shaw Support. Available but unsupported features: These features and/or functionalities are present on SmartSecurity but would require your own IT department to support and manage. A Shaw Support agent will not be able to assist with these features. Unavailable features: SmartSecurity does not provide these features and/or functionalities. All of the settings for your private, guest, and demilitarized zone (DMZ) networks are pre-configured so they should only be altered if you have a specific requirement, such as adding new equipment, or if you need to modify the IP space for your private and/or DMZ network(s). 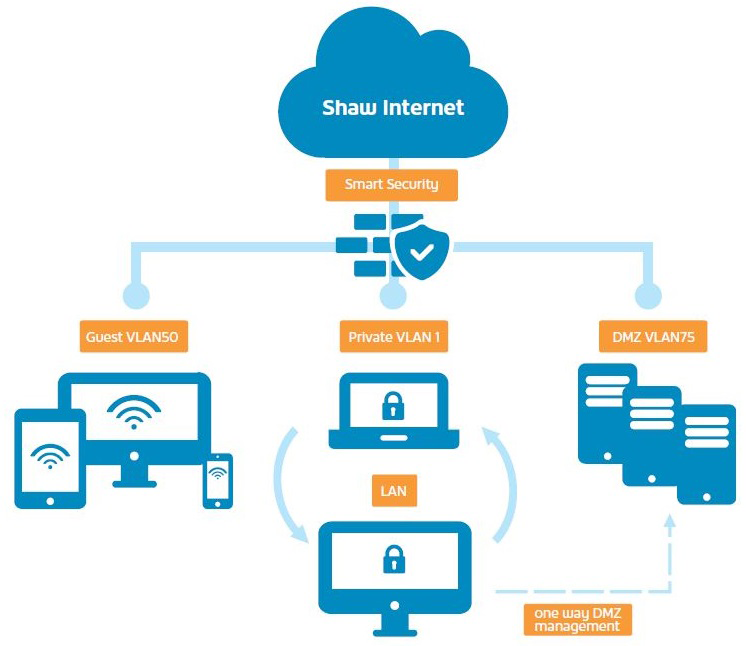 Note: If changes to the default settings have been made and you wish to restore your network(s) back to the pre-configured settings, please contact your local Shaw Business Technical Support representative for assistance. 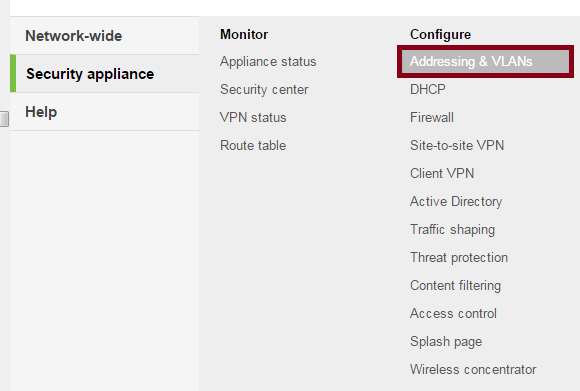 Hover over 'Security appliance', then select 'Addressing & VLANs'. 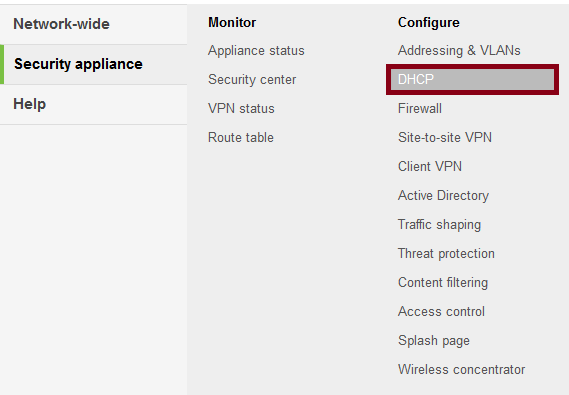 Hover over 'Security appliance', then select 'DHCP'. 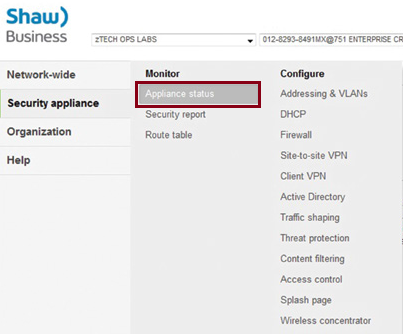 Hover over 'Security appliance', then select 'Appliance Status'.